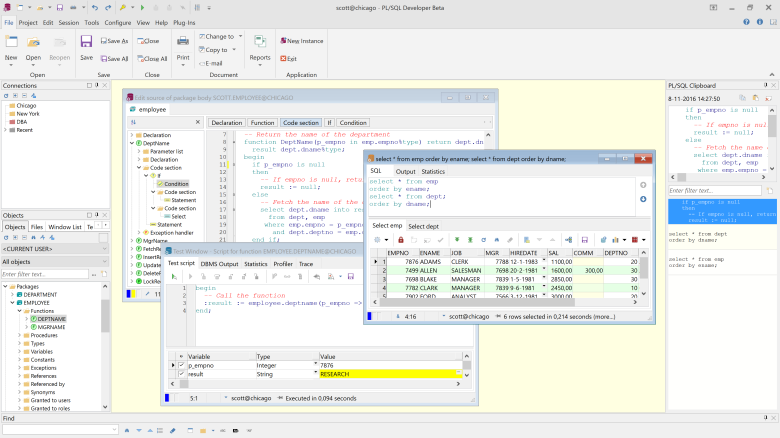 Что нового в PL/SQL Developer 12.0? The Quick Access Toolbar above the ribbon contains the most frequently used functions, so that they are always immediately available. You can customize the Quick Access Toolbar to your own liking. Users that prefer a menu-like system to preserve screen real estate can select to automatically hide the ribbon. 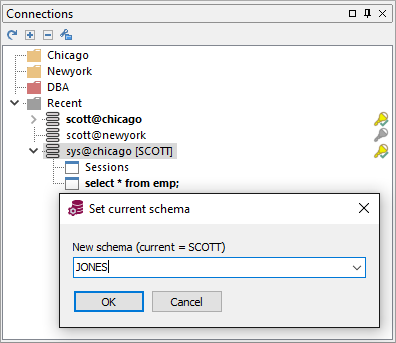 In the preferences you can select an option to revert to the familiar toolbar layout from PL/SQL Developer 11.0 and earlier. All window types now have a specific icon color, so that you can quickly identify the type in the Window List, in the SDI tab control, in the window titles, and so on. The transaction status is now visible in the status bar of a window, next to the "Saved" and "Executing" indicators. Added user interface preference "Preselect current user for object selection lists". At the bottom you see the PL/SQL Clipboard history items. Clicking on an item will show the text with syntax highlighting in the preview pane, and will show the timestamp above the preview pane. Double-click on an item to paste the text in the cursor location of the current editor or drag & drop it to a specific location in an editor. 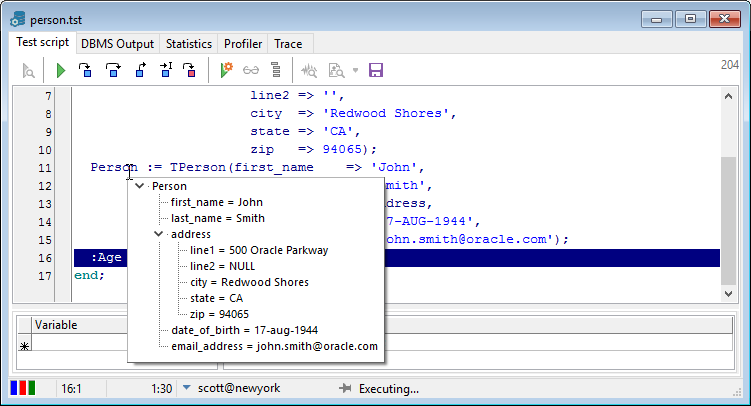 You can use the editor preferences to configure when and how items are added to and deleted from the PL/SQL Clipboard. 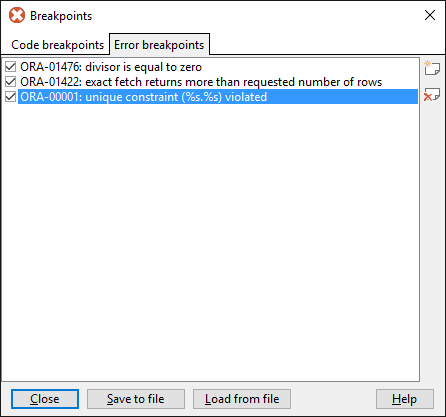 Breakpoints can now be saved and loaded. Debug object privileges can now be granted and revoked from the user interface. The Code Assistant can now describe sub-records. The Code Assistant now includes an <All> choice for default object type constructors. The Code Assistant can now include synonyms for user object lists. 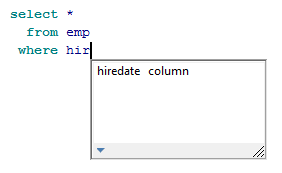 The Code Assistant no longer pre-selects <All> after typing part of a parameter/column name. 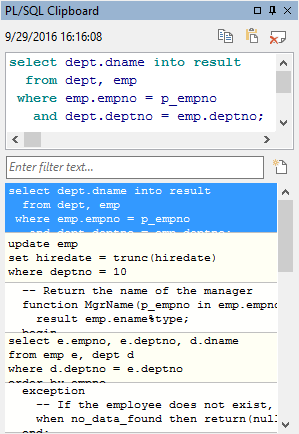 Changes made and saved in an external editor will automatically be propagated to the column data. 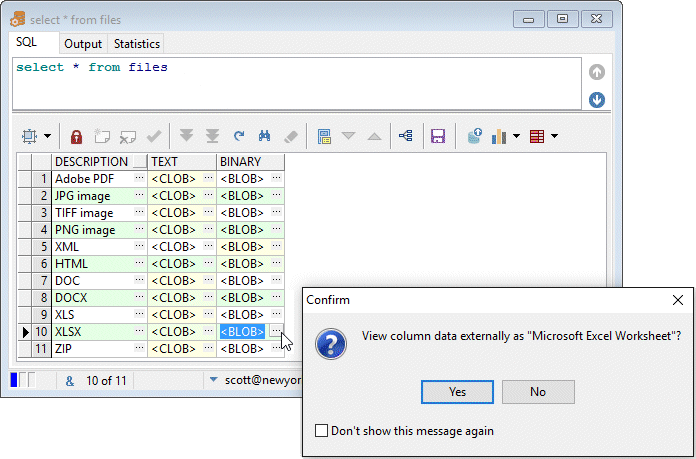 The SQL Window will now navigate to the offending cell in the result set after an insert or update with a column-specific error. 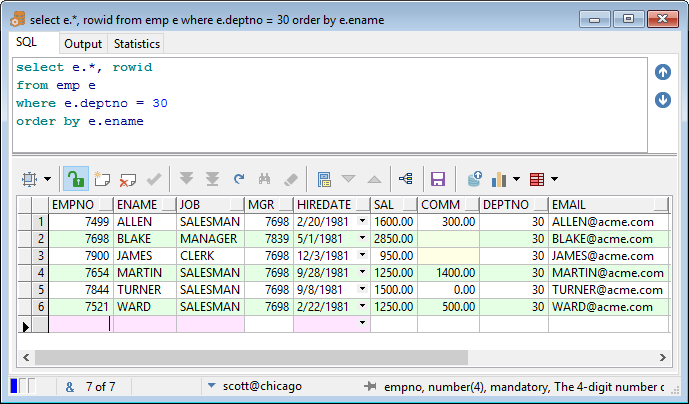 The rowid column is now omitted when exporting a result set grid in SQL format. A new Oracle / Output preference has been added to save dbms_output to a file. The filename can include %dbname%, %dbuser% and %date% variables to separate output files based on the database, user and date. You can now suppress a hint or warning for a specific line of code by adding a "-- Ignore" comment. The Code Contents pane now shows local subprograms within a procedure/function in a separate folder. You can now kill a session with the "immediate" option. Connecting through a proxy user is now supported. A Compare function has been added to the Object Browser. 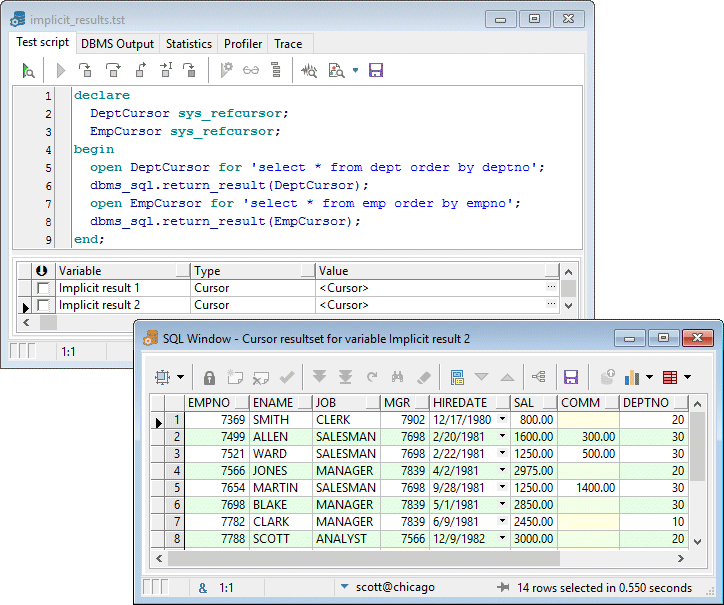 You can compare program units, tables, views, sequences with sources in the database, in a file or in a window. A new Oracle / Options preference "Always include owner prefix" has been added. 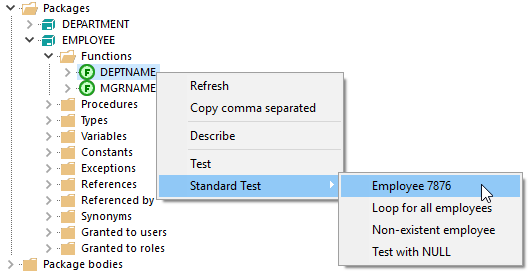 When enabled, DLL extracted from the database will always include the owner prefix. When disabled, the owner will be omitted if you are connected as the owner. A new "Stop" item has been added to the DBMS Scheduler "Running job" popup menu. Support has been added for Oracle12c read privileges for tables and views. 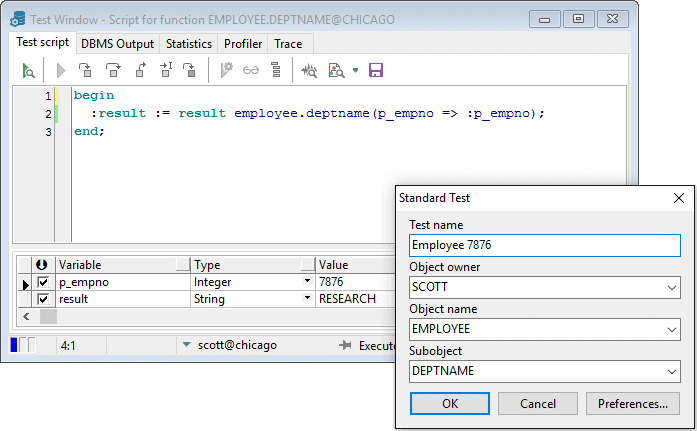 Scripts generated by Export User Objects and Export Tables now have user-defined initialization and finalization. 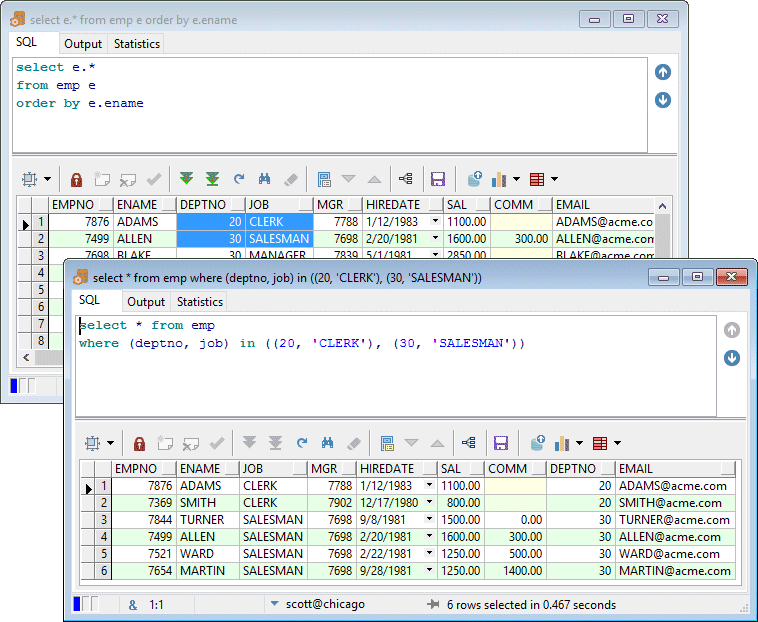 These files are located in the %APPDATA%\PLSQL Developer 12\Scripts directory. The Text Importer and ODBC Importer can now also truncate a table before import, in addition to the "Delete" option. The truncate option is faster but cannot be rolled back. The Compile Invalid Objects tool now has a User Selector. 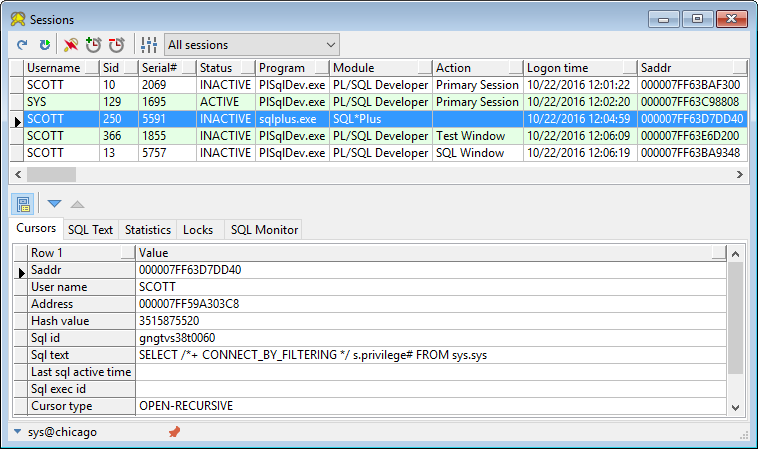 PL/SQL Developer 12 now comes as a new MSI installer for interactive and silent installation.